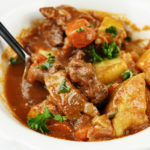 Slow Cooker Beef Stew has to be one of the best slow cooker recipes on the planet during cooler weather. Hearty, delicious, and oh so comforting. Beef Stew was one of the very first dishes that I remember making for the Mister when we were first married. I remember it vividly because it was less than a total success for many reasons. I made it in the tiny kitchen of our first two bedroom, one bath home on the main street in town. We never knew the exact age of the house, but when we first visited it one day during our lunch breaks from work, the heels of my pumps sunk through the dry-rotted green carpet with every step that I made. But we loved it and saw all the potential in that little brick house. We were so proud of our first house and over time fixed it up to be such a cute home. But, the day I made Beef Stew was one I will never forget. I’d planned the meal to the nth degree and while my new husband was busy working on a project on the house, I was determined to make him a dish his Mama told me was one of his very favorites. We still joke about that bowl of beef stew that we each politely nibbled a few bites of and then quietly made its way to the garbage disposal. Luckily, since then, I’ve become a much better cook and can practically make Beef Stew with my eyes closed. 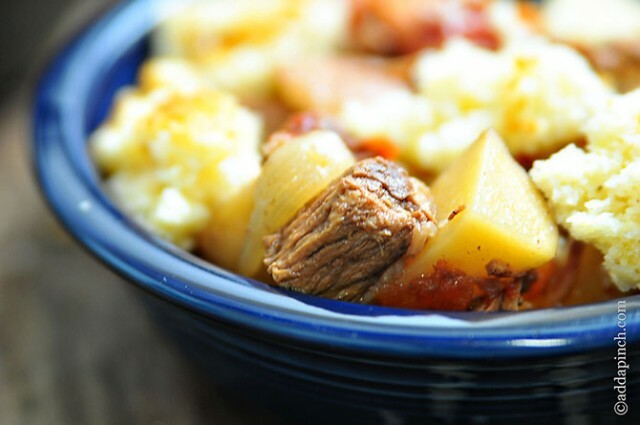 I’ve shared my recipe for cooking Beef Stew before, but this Slow Cooker Beef Stew version is perfect for busy days when you need something comforting and delicious for supper. 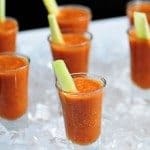 Serve it with cornbread and you have a meal that anyone would love! 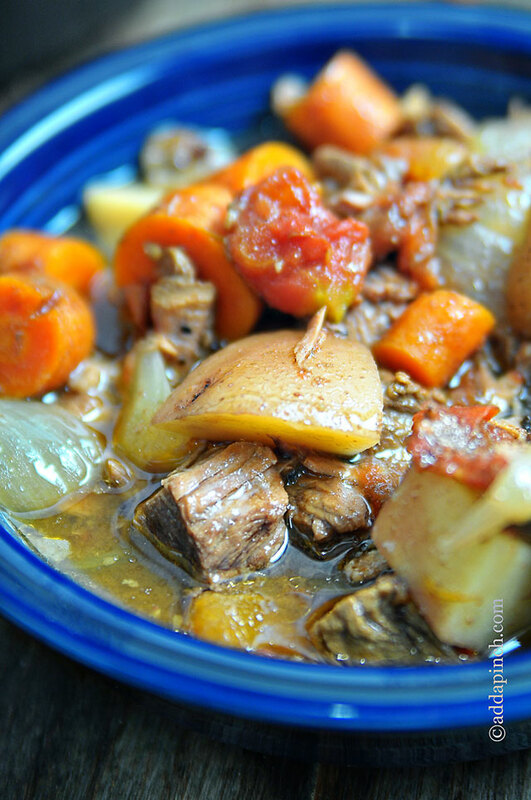 Here’s my Slow Cooker Beef Stew Recipe. Make it soon! 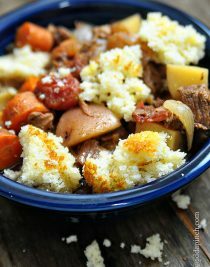 Slow Cooker Beef Stew is perfect for those busy days when you need a comforting bowl of beef stew for supper! 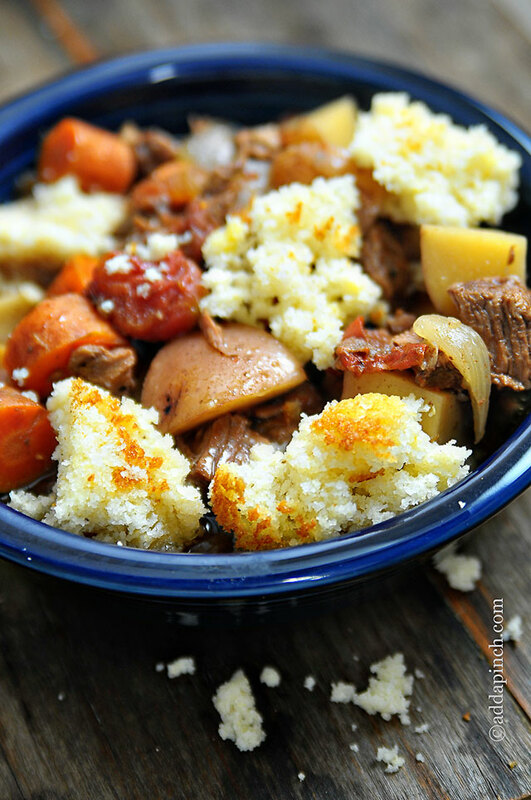 Get this easy, slow cooker beef stew recipe that your family is sure to love. Spray insert of slow cooker with non-stick cooking spray. Add all ingredients to slow cooker insert and cook on low for 6-8 hours or high for 4 hours. I’m sorry I don’t understand how much meat I will need to make this recipe for slow cooker beef stew. Please let me know. Looks delish! 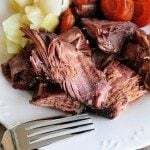 You are going to use a 3-4 pound chuck roast that you cut into bite-sized cubes for this recipe. Can’t wait for cooler weather…this looks wonderful. Beautiful photos. Thanks for sharing. Thanks so much, Mary. We couldn’t wait any longer. One of our favorite meals when there is even a hint that fall is on the way! Ohhh my husband would love this! I don’t make beef stew enough. Looks delicious Robyn! Thank you for this! You have no idea how much I have been in of a good beef stew recipe! Everyone I have tried has turned out just boring! Your looks incredible and like something my whole family would enjoy! Yes! Total comfort food! I need it. Head my way and I’ll have a bowl waitin’ on ya! I want to swan dive right into that big bowl of comfort! MMMMMM. Oh yes, this is a hearty meal for sure. Makes me excited for the colder day of fall/winter and all the delicious comfort food that comes along with it. You make it look so wonderful and I love that it’s not all gravy. I can almost taste it from your pictures! 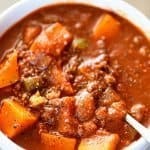 This is the ideal crockpot meal for fall!! I Love it! Slow cooker meals are always a sure bet for busy nights. Love this stew!! Hi, are the fire-roasted tomatoes readily available? I’m SO excited that everyone is ready to use their slow cookers again. I like using it all year but I’m weird like that 😉 Yay for soups, stews and more! 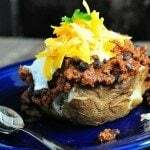 I just made this recipe using ground hamburger meat as it was all I had on hand…DELICIOUS! 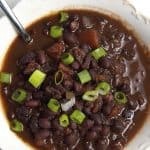 I have this cooking in my crock pot right now and it smells delicious! Your blog is one of my favorites when it comes to a family pleasing recipe. Never fails that it is a winner! I have this one in the slow cooker right now and it smells delish! I use my slow cooker year round. It’s just too easy not to! I haven’t had this yet but I’m rating it based on smells! Thank you so much. Looks delicious. I will make it for Saturday. Thank you for all your recipes. Will try many of them. Will continue to check your site. When you list steak seasoning, are you referring to A-1 Sauce or a dry spice? I am referring to a dry spice steak seasoning mix. Yes, I am using a dry steak seasoning in this recipe. I hope that helps! Comfort food indeed! Pinned it to try soon!! Just made this for lunch today, it was delicious and my husband actually asked for thirds!